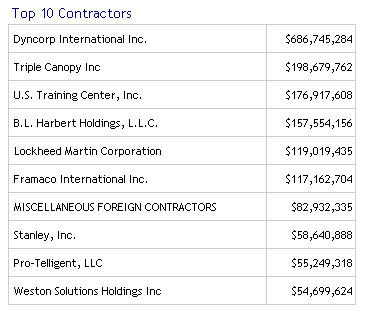 This list of the State Department’s Top 10 Contractors is from USAspending.gov. You can also view the Contractor Profiles in the website. The Federal Funding Accountability and Transparency Act of 2006 (Transparency Act) requires a single searchable website, accessible by the public for free that includes for each Federal award: 1. the name of the entity receiving the award; 2. the amount of the award; 3. information on the award including transaction type, funding agency, etc; 4. the location of the entity receiving the award; 5. a unique identifier of the entity receiving the award. USAspending.gov, a re-launch of www.fedspending.org, provides this information to the public, as collected from federal agencies, in an easy to use website. The data is largely from sources: the Federal Procurement Data System, which contains information about federal contracts; and the Federal Assistance Award Data System, which contains information about federal financial assistance such as grants, loans, insurance, and direct subsidies like Social Security. The website is searchable by contractor, place of performance, by agency; also by competition process, type of contract or product/service purchased. Click here for an explanation of the data included in the website.